I have some hefty financial goals. I want to be debt-free, build up $30,000 in retirement and save $10,000 in an Emergency Fund by June 2019 (I’ll be turning 30 that month). I have some less-than-hefty, yet still-important goals too. They’re more short-term, like going to every Needtobreathe concert within a 4-hour drive. To each his own. Setting financial goals is one thing. Reaching financial goals is another. Reaching your goals is a habit. It requires discipline, patience, a plan of action and determining what’s most important to you. Personal finance is personal. Your goals aren’t going to look like everyone else’s. Their reasons for spending or saving their money do not have to be your reasons for spending or saving your money. I don’t want to have to ask anyone for help. 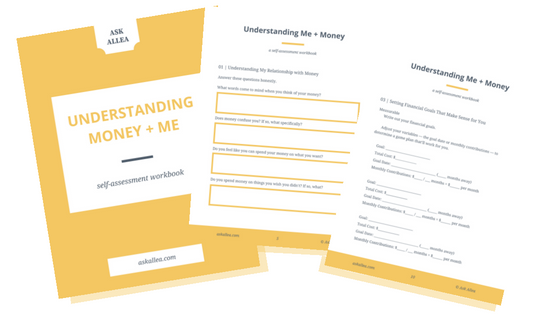 I’m fiercely independent, and though I will ask for help if it ever comes to that, I have this innate feeling that I’m able to (and expected to) get my financial life in order. I have the means to make money, save money, invest money and spend money, so I want to do that how I want. And I want to sleep at night knowing I have the moolah to cover the unexpected, if needed. Because it will be needed (Exhibit A). I don’t want to ask my parents for money. I don’t want to ask friends for money. I certainly don’t want to make any trips to Paycheck Advance. So I'm saving up an Emergency Fund. I want to travel the world and not have to worry about debt. So I'm paying off my student loans. I want to retire some day. So I'm taking advantage of time and compound interest by building up a retirement fund. If I make a plan now, I’ll have peace of mind and freedom to spend, travel and retire later. You’ve got things you want to do, see, experience, own. Perhaps you want to get out of debt, so you can stop owing people (oy, I know the feeling). Or you’re saving up for a minivan to keep your growing family safe. Or you’d rather buy an RV and leave the city far, far behind. So that’s it. We have a number: I’ll need to save $83 per month in order to save up $2000 for a trip to Sweden. That $83 is much easier to mentally digest than $2000. Adjust your variables — the goal date or monthly contributions — to determine a game plan that’ll work for you. Goals can feel lofty — and perhaps they are lofty! So when you’re setting financial goals, set a number, make it realistic — you know, so it doesn’t cramp your style — and stick with it. As much as I wish I could put $500 a month toward my debt, $500 into savings and still spend $200 a month on clothes, that’s just not a reality. I don’t have that kind of money. So we have to prioritize. Take a clear look at your spending, then write out your big financial goals and hypothetically move dollars around your different budget categories until you come up with a plan for reaching your goals (slowly and surely!). Is it realistic to put an extra $100 toward your debt each month? Or an extra $200? Test it out and see. When you decide how much money will go where, give yourself a length of time to plug away at those goals. Don’t go switching and updating, here and there, every month. Adjust as needed, just not so much that it makes you anxious or keeps you from actually reaching your goals. You don’t want to be your own Achilles heel, if ya know what I mean. A key to successfully reaching your financial goals is creating good habits. We can reach big goals by taking small steps, regularly, in an intended direction. If you’re “only” saving $20 per paycheck to go into savings, it’s something. And little by little, you’ll get there. What’s that saying, “How do you eat an elephant? One bite at a time.” That applies here. Add your goals into your budget. I set up goals, whether long-term or short-term, to roll over from month to month in Mint. It shows up as a “credit” when it rolls over without being spent, meanwhile those dollars are actually sitting in my checking account for the day I’ll actually spend them. For big, long-term goals, like paying off debt or saving up for a trip, I break it down into monthly amounts so I can save it over time. I’d rather save $83 per month for a trip than scramble to find $2000 when it’s time to buy the flights. It’s less stressful to build it up over time. Then, under the mindset of “Allea not wanting to ask anyone for help, if she can help it,” I save $40 per month in a vehicle “Service & Parts” budget. I know I won’t spend $40 every month, but it’ll be there when I need it (Exhibit A). By setting up automatic savings transfers, you won’t even have to think about moving money there each month. When building up your savings account, treat it like any other expense — like rent or groceries — and make it a priority to “pay yourself first.” Each transfer is a casual, low-hurdle investment for Future You. It may not seem like much, though small and seemingly insignificant, but they add up! You can automate funds toward a retirement account, too. Like I said before: Reaching your goals is a habit. It requires discipline, patience, a plan of action and determining what’s most important to you. Once you have a plan that could work, write it down, put it in your budget and stay disciplined. No one else will hold you accountable to it, so you’ll need to stay focused. Have you identified your financial goals yet? Do you have a game plan for reaching them?